The Trade application provides you with the capability to quickly find instruments and trade them in your workspace. After creating and opening a workspace, you can use the Market Explorer in Basic mode or Advanced mode to find an instrument and open a widget. Market Explorer opens in Basic mode as shown when you click Explore on the TT menu bar. Exchange — Shows the exchanges available to trade on TT. Type — Shows the product types natively supported by an exchange. Product — Displays the products available at an exchange. Instrument — Displays the tradeable instruments per exchange, product type, and product. Widget — Shows the widgets available per instrument. In addition to Basic mode, the Advanced mode allows you to easily find options instruments, exchange-defined spreads, and strategy instruments without using a contextual search. 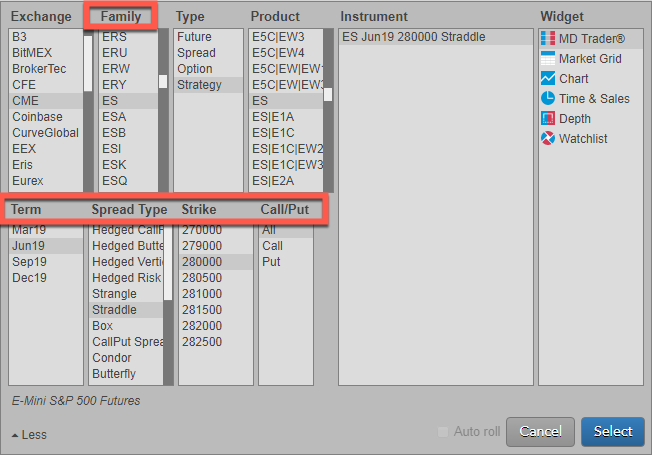 In Advanced mode, you can filter futures, options, spread, and strategy products by product family, expiry, spread type, strike, or Call/Put to select an instrument and open a widget. Family — Shows all options with a shared underlying futures symbol. Term — Displays each expiry for a product. Spread Type — Shows the exchange-defined spreads or strategies based on the product type and product. Strike — Displays the underlying strike prices for each option or strategy product. Call/Put — Allows you to filter options or strategy instruments by Call, Put, or both (All).